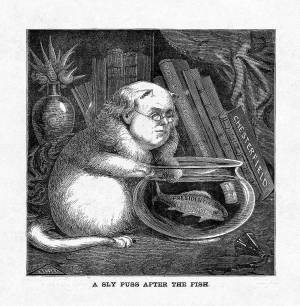 In this early prediction of Horace Greeley's entrance into the 1872 presidential race, the editor is portrayed as a cat toying coyly with an apprehensive goldfish named "Presidential Nomination." In the background, Greeley's gentleman-farmer persona is symbolized by a bouquet of vegetables in a vase and his book, What I Know About Farming. Prominently displayed near the latter is a more famous advice book, The Letters of Lord Chesterfield to His Son. In the right foreground is the editor's spilled inkwell.